You might have an outdoor area with a nice sun lounge or maybe heading out on your boat is your thing. My favorite is grabbing a new book, or maybe an old favorite, and laying in my hammock. Either way you want to make sure your outdoor furniture, and toys, big and small, are protected from the sun’s harsh UV rays. The sun can cause irreversible damage to most items that are left exposed to it for hours, days, and months. This applies not only to your clothes but your outdoor furniture and boats too! Now I’m not a science whiz, but I do know the sun will actually bleach your furniture when left out for long periods of time. You may know this already and have always been taught to hang your clothes out to dry inside out for this reason! If you want to know why this happens, you can dive into the science behind it. So you have some outdoor furniture and you want to prevent it from looking old and aged. That’s why today we are going to look at how we can minimise and hopefully prevent sun damage to your outdoor items! I know all too well that these items can be a big investment so you want to prolong their life as much as possible. I’ve researched the best UV fabric protector for you to help make this happen! After thorough research into requirements for the best UV fabric protectors to be protect your outdoor gear and furniture, SimplySunSafe recommends the Scotchgard Water and Sun Shield with UV Protector as the best UV fabric spray. Read on for a detailed buyer’s guide, comparison table, and in-depth reviews of the top 5 UV fabric protectors. With most of us being time poor in this busy world, you’re probably like me and want something that is easy to get on and doesn’t take hours and hours of application time. Sprays are always my preference, especially if you are doing large items as sprays cover larger surface areas quickly. If, like me, you always forget to do things until the last minute, this one will be important. Being able to apply and let the UV protector dry quickly it’ll make your life a lot easier! There is nothing worse than stains on your nice outdoor items. It makes things look dirty and old, so if you can protect your fabric from the sun and stains it’s a bonus! This will also be an important consideration if you have children as we all know they can make quite the mess. Many UV fabric protectors also repel water which assists with protecting your outdoor items from the sun. Water is an essential part of the bleaching process when the sun’s UV rays hit your furniture so the more you can repel water the better! Just a reminder that UV protectors that are water resistant will not make your items waterproof. To read more about the difference between water resistant and waterproof see HZO’s article that explains it really well. 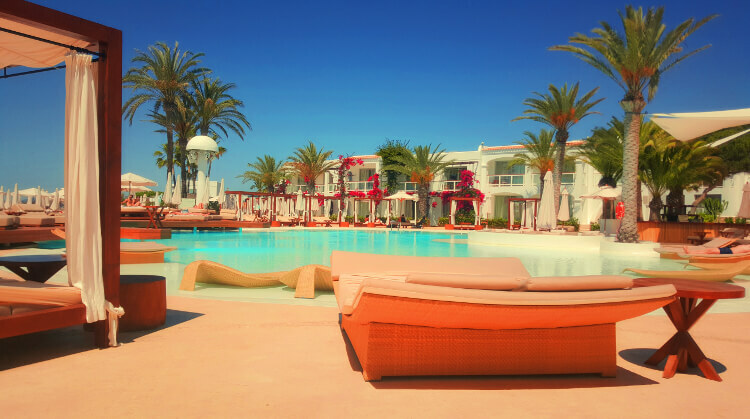 You may have just invested a lot of money on your outdoor furniture or boat so won’t mind spending a little more on protecting it. However, if you don’t fancy spending too much of your hard earned dollars I have found some reasonably priced options for you as well. After thorough research that combined discussing issues with customers, reviewing customer feedback, examining manufacturer specifications, and participating in boating forums, SimplySunSafe has chosen the 5 best UV protectors for fabrics and boating. All of these UV Protectors have a variety of the features we discussed above with options to suit everyone’s budget. 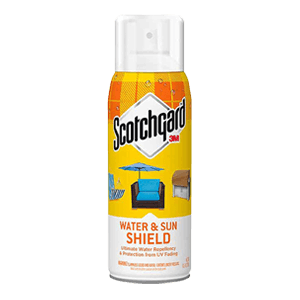 Here it is, the best fabric protector for furniture – the Scotchgard Water and Sun shield! Protect yourself from both water and sun with the one can. This spray application protector works on a variety of outdoor fabrics including leather and suede. Great for all over protection. It also has stain resistance so you can clean up spills and it’s like they never happened! For application it’s an easy spray on and leave to dry process. Once applied it dries odorless and resists yellowing. One can will cover approximately 60 sq. ft. of light fabric or 20 sq. ft. on your heavier fabrics so be sure to take this into account when you make your purchase. This one is on the higher price point per ounce but Scotchgard’s worldwide reputation always holds up and you can guarantee you are getting a great product. This one is available in two convenient sizes 10.5 oz and 21 oz. Get Scotchgard Water and Sun Shield Now! My champion choice for all things boating. This UV Protector is a great choice for those wanting to protect surfaces like leather, plastic, metal, vinyl or rubber. So basically this is a great choice if you have a boat. To apply ensure your surface is dry and clean and then spray on. After application you then will need to wipe dry and watch out for streaking if too much product is used. Unfortunately this product will not air dry so make sure you wipe it dry! You might also want to get your muscles ready as this product will work better if you buff it as well. 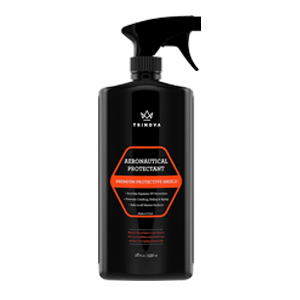 If you are after something for a specific surface, this is the best UV protection spray for plastic. It comes in a range of sizes depending on much coverage you need as well so you don’t need to buy more than you need. It’s not well-suited to your outdoor gear and clothing as it does not list fabric as a recommended surface. So it may not be the perfect choice for you if you’re not into boating. 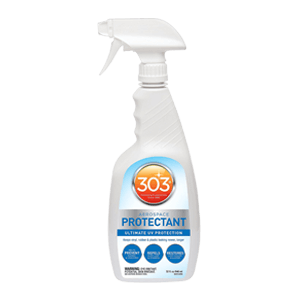 Get 303 UV Protectant Spray Now! Here we have another great option for all of our boating fanatics out there. This UV protector works will on plastic, rubber, vinyl as well as all marine surfaces. You can just spray your entire boat! To apply it comes in a handy spray bottle but you are required to spray on and then buff off with a dry cloth on this one but hey boats are a big investment so it’s worth the extra work! Recommended reapplication time is 3-5 weeks. This one will also work on some outdoor furniture if it’s metal, wicker or plastic. Available in one size only but is a budget friendly option. Get TriNova Marine Protectant Now! 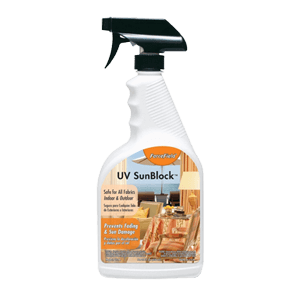 The ForceField UV Sunblock Fabric Protector is perfect for all your furniture. From fabrics to fibres this one has got you covered to prevent fading. It is safe to use on a whole bunch of other materials too and won’t affect the fabric by stiffening or yellowing. Safe to use on everything from leather, wood, rugs, and outdoor furniture. To apply its got a spray gun for easy application and is quick dry for those of use who don’t have the time for a more intense application process. It is recommended that you use the ForceField UV Sunblock Protector with the ForceField Fabric Protector to ensure you get stain protection. If you are after just UV protection for your furniture this is the pick for you. Get ForceField UV Fabric Protector Now! This UV fabric protection spray is a great purchase. It is available in a small 16 oz size if you have smaller items you need to protect and goes all the way up from 32 oz to 1 gallon to 303 Marine UV Protectant. A small 8oz bottle will still treat 20-40 square feet of fabric! It has a water-based formula so it’s environmentally friendly and its special formula allows for a stronger bond to your fabric. It also has no odor, will not yellow or leave your fabric hard and stiff once dry. Sounds good right!? The only downsides to this sun protection spray is that it’s specifically for fabrics and doesn’t offer water or stain protection. So it’s not a great multi-purpose spray, but for UV protection it does an awesome job. 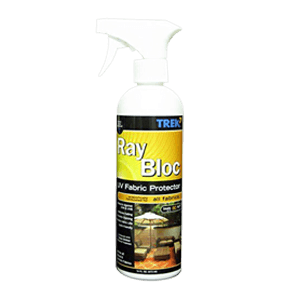 Get Ray Bloc UV Fabric Spray Now! Well, I wrote this for all the boating enthusiasts, weekend BBQ-ers, outdoor readers, and for those who love a lazy Sunday in the hammock. You invest money in your items and you want to keep them in the best condition possible. 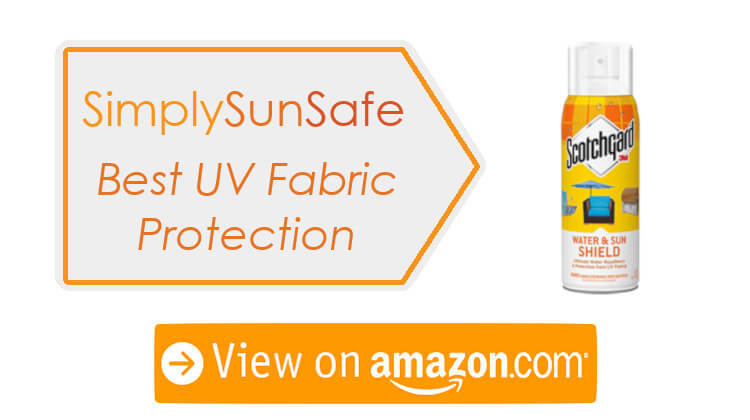 SimplySunSafe recommends the Scotchgard Water and Sun Shield with UV Protector as the top pick for protecting your outdoor furniture from the irreparable effects of the sun. After thoroughly researching the best UV protector, this was my favorite. Its features are outstanding and the price point meant that is really is the best pick. If you are after a UV protector for your boat, then definitely check out the 303 Marine UV Protectant which is great for protecting plastic, vinyl and rubber. This one does required a little more effort when applying but it is well worth investing your time to keep everything looking nice and new. Often we are out on the water with kids so if you need a refresher on how to keep them sun safe while out on your boat see the Children’s Hospital of Pittsburgh website for some sun safety tips. I love hearing from my readers, so if this article encouraged you to make a purchase, or if you found a better option for you that didn’t make this list please let me know about it in the comments. I love updating my guides and undertaking research to ensure I have provided my amazing readers with the best information possible.